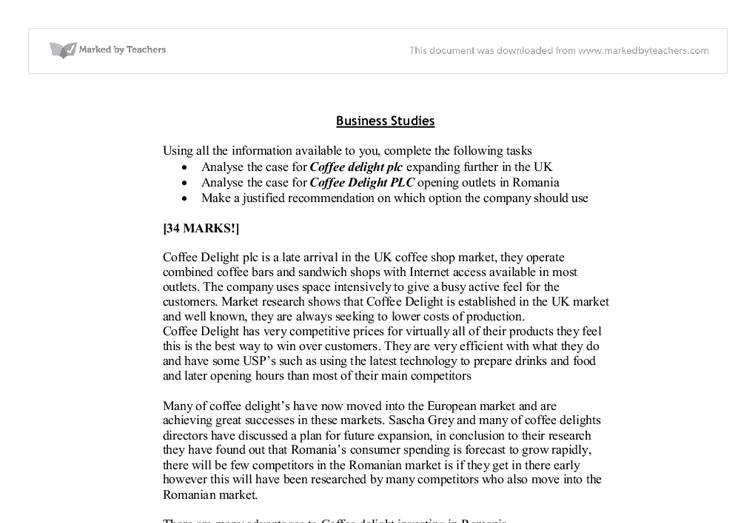 Business Studies Using all the information available to you, complete the following tasks * Analyse the case for Coffee delight plc expanding further in the UK * Analyse the case for Coffee Delight PLC opening outlets in Romania * Make a justified recommendation on which option the company should use [34 MARKS!] Coffee Delight plc is a late arrival in the UK coffee shop market, they operate combined coffee bars and sandwich shops with Internet access available in most outlets. The company uses space intensively to give a busy active feel for the customers. 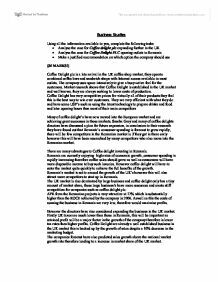 Market research shows that Coffee Delight is established in the UK market and well known, they are always seeking to lower costs of production. Coffee Delight has very competitive prices for virtually all of their products they feel this is the best way to win over customers. ...read more. However coffee delight will have to enter the market quite quickly to achieve the full benefits of the growth. Romania's market is set to exceed the growth of the UK's however this will also attract more competitors to start up in Romania. The UK market is also dominated by large business and coffee delight only has a tiny amount of market share, these large business's have more resources and create stiff competition for companies such as coffee delight plc. APR from the Romanian projects is very attractive at 17% which is substantially higher than the ROCE achieved by the company in 2006. Aswell as this the costs of running the business in Romania are very low, therefore would maximise profits. However the directors have also considered expanding the business in the UK market. ...read more. Romania have different laws to the UK, also different customs and a different culture therefore this will have to be studied in depth before a final decision has been made. There is also a high degree of risk in setting up a business in a foreign country, it will depend on the attitudes of the management teams and shareholders to risk. There is also a limited amount of data available to coffee delight. Competitors also have a major say in whether the decision will be worth it, for example if they have the financial capacity to enter the Romanian market and to provide tough competition but this is not working then the Romanian market may not be as attractive as first thought. Finally the company have no experience of operating outside of the UK therefore they would need to hire specialist managers and staff with these expertises. From the above points I feel that Coffee Delight should concentrate on expanding in the UK market. ...read more. Their mild coffee is tailored to Korean tastes. * Cafe Nescafe has 25 outlets in Korea, and is planning to expand to 90 in five years. They have several small take-away outlets, and serve 45 different drinks, plus a selection of pastries. * Java City Coffee, which opened in October 2002. Organizational culture and change Senior (1977) describing that some element of culture can be supportive for change and some other can be defense against the change process. Organizational Culture and Change Source: Senior, 1977. For implementing the cultural change we can use the normative systems model for cultural change. with the same measures as the customer; he/she can also choose the face and the hair. After that the customer can dress the model so it is possible to see how he/she would look like. The website is offered to customers who want convenience i.e. this is because accounts roles are to put business finances into accounts to then let the business know what the overall result is and using that data, how they can improve their business, however as you are paying for their time this could result to being very costly. Ordering service- the ordering service is where the business must guarantee that there customer?s get the products they ordered alongside the county they are in and also then receive the products in the correct time.